When this excess electricity is sent back to the grid, the electric company must then buy that energy from the customer with solar panels. 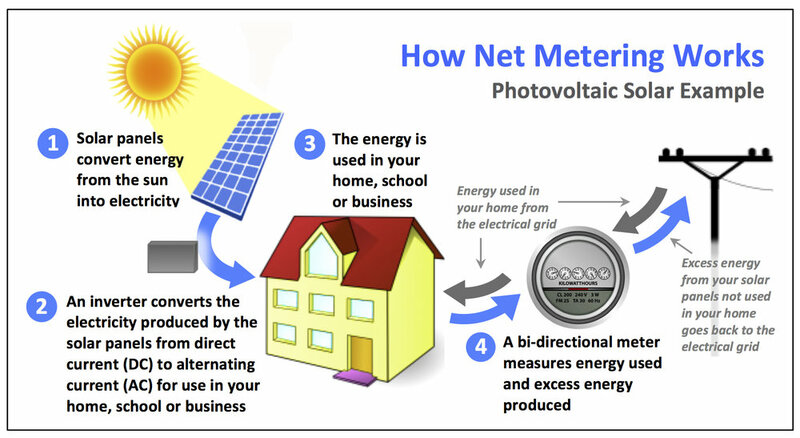 The billing system that makes this transaction possible is known as “net metering.” The customer is only paying the “net” total of electricity used from the utility minus electricity sold back to the utility. If you generate more power than you use in a given month, your electric bill will have no kilowatt hour charges, and you will only have to pay the basic utility service charges. The surplus energy will generate kilowatt hour credits that will be applied to your future electric bills. Unused credits will accumulate in your Pacific Power or City of Ashland account. This means credits accumulated during sunny summer months can be applied to charges during Oregon’s cloudy winter months, eliminating the need for batteries to store your excess energy.